If you’ve been visiting WeAllSew for a while, you may have deduced that I adore my overlockers. Well, I have a new little guy now, sitting on the table next to my 1150 MDA: The L 220 cover- and chainstitch machine. The L 220 only does one basic stitch formation – cover/chain – so it’s easy to set up and thread. It doesn’t do an overlock stitch, and it doesn’t have a knife to trim edges. But it’s always ready when I want to attach a stretchy binding to a neckline, topstitch a seam in a swimsuit, or hem a jersey knit skirt. It can do so many other things, too! 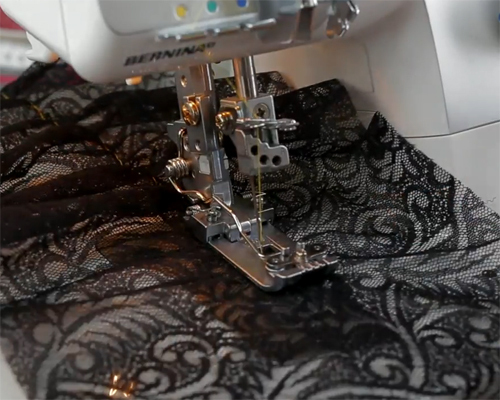 You’ll see some of them in this video tutorial from BERNINA International, as well as tips for threading the machine and adjusting the settings for different effect. Check out the Bow Tie by IDILVICE project posted here on WeAllSew earlier today; the strap is stitched using a coverstitch technique demo’d in this video.